Whether you are visiting for work or pleasure, feel at home here. Come enjoy the serenity and beauty of the Puget Sound Dyes Inlet from your 2 bed 1 bath vacation rental. This is a well maintained, side by side duplex with ample private parking. A deck facing the water allows you to sit back and watch for Orcas that frequent the Sound or just enjoy the sunrise/sunset with coffee or wine. Located just steps from the bus line and minutes from the ferry terminal to Seattle, Puget Sound Naval Shipyard, Olympic College, Harrison Medical Center, Kitsap Conference Center, and downtown Bremerton's shops and restaurants, you will be close to Bremerton's attractions. The Olympic National Park and Cascade mountain range are within driving distance for the adventurers out there. Our lovely rental offers a fresh space with hard surface flooring throughout. The master bedroom features a queen bed with memory foam mattress, a large walk in closet, and desk for additional private workspace. The second bedroom provides a full sized bed with memory foam mattress and closet. A spacious full bathroom is the perfect size for accommodating your needs. The fully equipped kitchen, dining room, and living room with wood burning fireplace are all open to the gorgeous water view. Off street parking provided for convenience and additional street parking available, if needed. Wi-fi and cable with STARZ provided for your convenience. My husband and I have been living in Bremerton for the past ten years. I grew up in the area and my husband was transplanted by the Navy from the midwest. We both live and work in Bremerton and enjoy all it has to offer. My husband and I have been well acquainted with this property for over the past five years. We have always envisioned it as the perfect vacation rental for it's breathtaking views, size, and location. Having lived in Bremerton for the past ten years, we have fallen in love with ocean and mountains close at hand and so accessible. LOCATION, LOCATION, LOCATION! This property is perfect for those on work travel, visiting loved ones serving in the military, or those relocating from out of the area seeking long term housing. Located close to Bangor Naval Base, Puget Sound Naval Shipyard, Harrison Medical Center, the Seattle-Bremerton Ferry Terminal, and plenty of restaurants, bars, and parks, the property is a perfect place to explore the area. Bath towels, hand towels, and washcloths, bath mat, hand soap, and hair dryer provided. Air conditioning unit in master bedroom. All sheets, blankets, and pillows provided. Off street parking provided in rear of home. High speed Wi-Fi provided for your convenience. A set (bath, hand, washcloth) of 6 towels will be provided. Guests may request more prior to check-in. Adult and kid friendly dishes/utensils provided. Fully equipped with dishes, mugs, wine glasses, and cookware. Salt, pepper, and cooking spray provided. A table with 4 chairs is provided. High chair available upon request. TV with cable provided in living area and master bedroom. A deck faces the water view accessible from living area. We absolutely loved the place! It was very clean and comfortable for our family while we visited our daughter who is stationed in Bremerton. The view was fantastic. The owner was very accommodating and responded quickly to my messages. 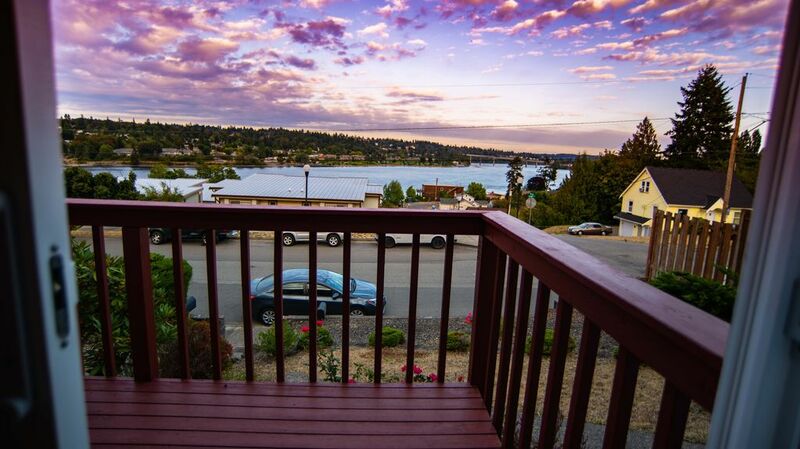 We definitely would recommend this home and will book it again for future trips to Bremerton. Thank you for the great review! We look forward to having you in the future! Great little rental. My husband, 1 year old son and I stayed for 11 nights and were very happy with both the house and the location. Good layout, greats views of the sound and Mt Rainier, and JoAnna was extremely accommodating. Will definitely try to rebook if we ever come back! It’s the 2nd time Joana and Justin have allowed me to stay in their rental. So convenient ... recent renovation , makes it just perfect. Property was as advertised...clean and convenient. I was staying in the area to care for a family member in the hospital. This home allowed easy access convenient to grocery store and restaurants. I was very comfortable and had a nice view. The home was nicely furnished and the beds were comfortable. Had everything I needed for the week! It was nice to have a full kitchen and washer/dryer. The owners are flexible understanding with the schedule...the property was very clean on arrival...everything about the place just makes you feel your at home....I didn' t want to leave!! !